The Triple-D Dry System includes the latest technology and the best components available. For you tech hungry junkies we will provide some details explaining what makes this nitrous system so great. The key to maximizing nitrous horsepower is to keep the nitrous in a dense liquid form until it is injected into the engine. Sharp bends in the nitrous flow path cause the nitrous flow to become turbulent which causes gaseous bubbles to form in the flowing nitrous. Dense liquid nitrous makes more power than gaseous nitrous Period! 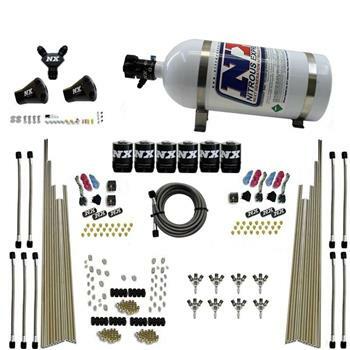 This NX nitrous system contains the key components that ensure you are getting maximum power per pound of nitrous used. NX Lightning solenoids feature an improved flow path that allows nitrous to enter above the seat and exit out the bottom for flow unmatched by any other solenoid on the market. Lightning nitrous solenoids feature an integrated purge port which allows you to connect a purge valve directly to the body of the nitrous solenoid. Purging through the body of the solenoid eliminates the air pocket between the purge valve and the solenoid orifice. Lightning Series solenoids feature CNC aluminum bodies topped with Carbon Fiber cans for the ultimate in weight savings. Nitrous Express only uses the highest quality, made in the USA components in its solenoids. Do not be fooled by low price come-ons, the solenoids are the most important component of a nitrous system.